Up to half of all dialysis patients are considered to be obese. If those with Chronic Kidney Disease (CKD) are more than thirty-five pounds over their recommended body mass index they are considered a "poor candidate" for a Kidney Transplant. Why is this? It has been found that heavier people have a much higher risk of potentially deadly complications following surgery such as heart attack, wound infection, nerve injury, and urinary tract infections. Further, individuals who are more than 100 pounds over their "ideal" weight are nearly twice as likely to die as a result of postoperative non-cardiac surgery. For this reason these patients are low priority to receive life saving cadaveric Kidney Transplants. However, new findings and breakthroughs have some questioning if this aspect of selecting Kidney Transplant recipients should be reevaluated. Many consider transplants to be the preferred treatment option for CKD patients because it typically results in a lower risk of death as well as a higher quality of life. Prior research, however, found that dialysis patients who are over-weight do better on dialysis than thinner people, but they are more likely to die following organ transplants. It makes complete sense for the Kidney Transplant risk-benefit calculation to take both of these issues into consideration when attempting to find the best transplant recipient. On the other hand, recent findings by the American Journal of Transplantation suggest that the risk of death one year after a Kidney Transplant declines just as much among those who are obese as it does for non-obese dialysis patients. So kidney transplant patients who are over-weight receive the same amount of benefit as thinner patients. This important news is timely with the changing environment and increasing regulation of Kidney Transplantation and underscores the fact that professionals may not want to prevent transplantation in obese patients. Moreover, minimally invasive robotic transplantation may reduce health disparities after Kidney Transplantation surgery for individuals who are over-weight. Obese patients who received robotic kidney transplants had fewer wound complications than patients who received traditional “open” transplant surgery, according to surgeons at the University of Illinois Hospital. This is accomplished by avoiding any incision in an obese dialysis patient's "infection-prone" lower abdomen, instead making only a small incision above his/her belly-button. This surgical alternative gives over-weight patients, who are frequently bypassed for surgery, an opportunity for a better quality of life. KidneyBuzz.com recommends that if you are seriously considering getting a Kidney Transplant you should not let the current waiting list criteria on "obesity" discourage you. In these cases you may consider identifying a living donor to circumvent the current allocation system. Regardless of the process you adopt to receive your transplant you should continue to work toward your personal peak health. Receiving a Kidney Transplant could give you a new "Lease On Life" and the energy as well as ability to shed extra pounds and improve your lifestyle which will help to ensure the longevity of your new kidney. How Can The Personal Out-Of-Pocket Costs for Kidney Transplant Be Defrayed? Warner, Jennifer. "Surgery Risks Higher for Obese." WebMD. 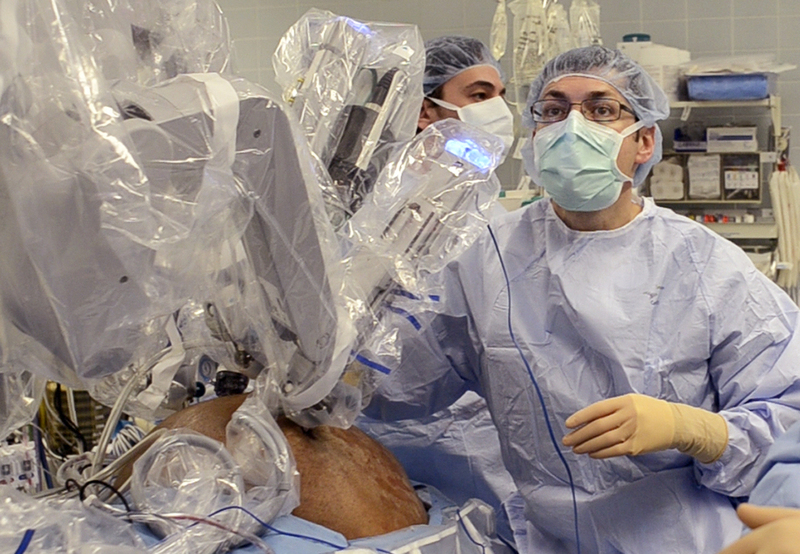 "Robotic Transplant an Option for Obese Kidney Patients." UIC News Center. "Obese Kidney Patients Benefit from Transplants." MedPage Today. "Robotic Transplant an Option for Obese Kidney Patients." Medical Express.